Birthdays in France resemble American birthdays in many ways, but there are some small differences. A cake or other sweet treat is always part of the celebration, as are presents, and the singing of Happy Birthday in French. Small differences range from the types of cakes and gifts, to the way a birthday meal is organized. 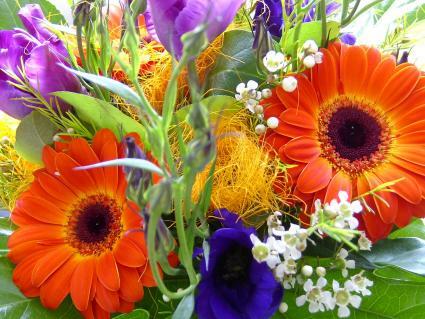 One way to celebrate a birthday in France is to bring the special person a bouquet of flowers. Although this tradition is common for women, giving flowers to a man is rare. In Québec, yet another song is sung on birthdays, notably an alternate text of the song Gens du pays, by Gilles Vigneault. Whichever song text is used, the function of singing the happy birthday song is to celebrate the person whose day it is and make that person feel special. In France, birthday gifts are another common occurrence. Like in the U.S., gifts depend heavily on the age of the person whose birthday it is. Children may receive toys, books, or games, while adults may receive jewelry, clothing, and perfume. What sets the gifts apart from American gifts is how they are packaged. While American gifts are almost always wrapped by the giver, often in patterned papers with flashy bows, many French shops giftwrap purchases that are intended as gifts. Store-wrapped presents often have a more refined look, with single-color paper and a flourish with the shop's name or logo. While American cake is frosted and served with ice cream, a French birthday cake has many more variations. A fruit tart can be a birthday cake, as well as a lemon cake or a chocolate mousse-filled tart, or any other sweet variation. The kind of frosting used for American cakes is rare in France; expect swirls of chocolate, whole nuts used as decorations, or glazed fruit and cream topping a French cake or tart. In France, tarts are often heavily decorated, but not with frosting. It is also quite common to purchase a birthday tart in France; moreso than in the U.S., and the birthday person's name is not typically written on the cake in France. Birthday cake can be served in the afternoon as the highlight of a birthday gathering, or can follow a dinner to celebrate the special day. For small children, it is most common to have a birthday party, in which case snacks and drinks are available, followed by a birthday cake. For adult birthdays or for family parties for a child, a meal is often included in the festivities. This can range from an intimate candle-lit dinner with several courses and fancy wines, to a large backyard picnic with cold and hot dishes in a laid-back setting. Both of these types of celebratory meals are more formal in France than in the U.S. for most families. The old French tradition for naming children involved calling a child by the name of the saint whose day it is on the child's birthday. Basically, in this tradition, the parents didn't choose the name for a child, but simply took the name that is assigned to the day of the year on which the baby was born. While French parents no longer do this, some parents use the saint's name as the child's middle name instead. For many French people, the name tradition means that they celebrate two days per year: their actual birthdate, and the day on which their name is celebrated. This second celebration, for the name, is not a gift-giving celebration to which the whole family and friends are invited, but rather a simple way to feel special for a day, similar to Mother's or Father's Day, but without the gifts. In order to fully experience a French birthday, you'll have to attend a few yourself. While the cake, songs, and gifts are traditions upheld in America as well, there are small atmospheric differences that vary from one family to another, and from one region to another. If you've been invited to a birthday, learn some of the phrases for wishing someone a happy birthday both in France and in Québec. You can learn the songs too, or simply learn these while celebrating various birthdays in the region. While the phrases and songs are easy to learn, the finer points of cultural traditions deserve in-person experience.